MULTAN: Senior politician Javed Hashmi on Sunday rejected Pakistan’s Tehreek-e-Insaf Chairman Imran Khan’s claim of having adequate evidence to produce in the Judicial Commission against the alleged rigging in 2013 general election. Speaking to the media, Mr Hashmi advised Imran Khan not to act childishly as the judicial commission was “very significant “initiative. He also lamented removal of Justice (retd) Wajihuddin, whom he said the world holds in high regard, from PTI’s tribunal. Hashmi said Imran Khan committed a “disgusting act” by elimination of the former Supreme Court judge and termed the move as the worst decision taken by the former cricket hero who he said always seems in the hunt for a neutral umpire. He said Justice Wajihuddin spent his whole life for the supremacy of law and the Constitution and his struggle in is an asset for the nation. 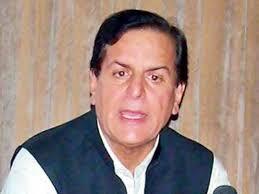 “Imran Khan, who claimed he would produce camels laden with evidence, has inadequate proof of rigging,” said he.